When Australian prime minister Julia Gillard let the opposition leader, Tony Abbott, have both barrels – labelling him sexist and misogynist during a parliamentary debate – footage of her onslaught rapidly went viral. 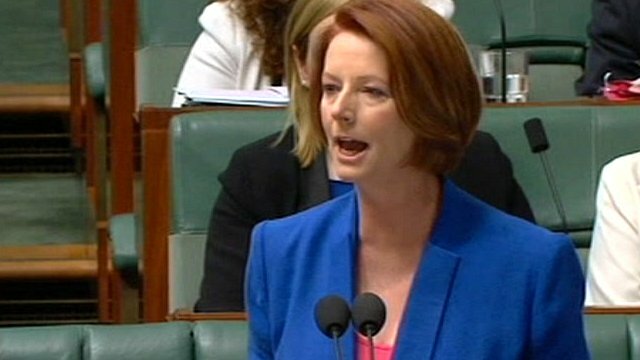 Australian Prime Minister Julia Gillard lambasts Opposition leader Tony Abbott for his sexist behaviour towards her. Gillard’s perfectly pitched attack in which, although clearly furious she remained utterly coherent and calm, has been described as a turning point in Australian sexual politics. It prompted the Macquarie Dictionary (Australia’s answer to the Oxford English Dictionary, apparently) to revise its definition of the word ‘misogyny’; and, in the wake of President Obama’s lacklustre performance in his first election TV debate, the New Yorker even suggested he could learn something from Gillard. Like many, I watched Gillard’s demolition of Abbott with an equal mix of glee and awe. Perhaps inevitably, it hasn’t take long for Gillard to get her comeuppance. Just a week after being lauded as a fearsome political performer, Gillard is once again attracting headlines, but this time for being a hapless, ditsy female, who can’t walk in her high heels. One a three-day state visit to India, which until that point had received zero attention in the British media, Gillard had the misfortune to get her heel stuck in wet grass and fall flat on her face, literally. She had the even greater misfortune for the episode to be captured on film, which is now receiving as much press coverage as did her barnstorming performance just a few days earlier. Footage of Gillard going sprawling (sometimes accompanied by with frame-by-frame still photos), made it on to most of UK newspaper websites, including some, like the Mirror and the Sun, which hadn’t reported her earlier trouncing of Abbott. ‘Aussie PM’s hilarious face-first tumble,’ was the Sun’s headline; it was her ‘third faux pas involving shoes this year,’ reported the Mail Online; more than one newspaper described it as her ‘fall from grace’. It’s surely no coincidence that, in a neat reversal of the notion of ’power heels’, all the coverage laboured the point that what brought about Gillard’s downfall was her high heels – the footwear most emblematic of femaleness. It is ironic that, between Gillard being feted for her triumph in parliament and ridiculed for her slip in India, the campaigning group Women in Journalism (of which I am deputy chair) published research* into the way women are portrayed in the British press. As well as confirming how much men dominate newspaper front pages (80% of bylines were male; 84% of people mentioned or quoted in lead stories were male), the research also showed distinct differences in the roles that men and women play in news stories. WiJ found that women are disproportionately likely to be portrayed as some kind of ‘victim’ – whether of crime, illness, or even, as in Gillard’s case, pesky high heels. By contrast, men quoted or mentioned were disproportionately likely to be ‘experts’. Three quarters of all the ‘experts’ in newspaper lead stories were male; nearly 80% of ‘victims’ were women. Of the women named in lead stories, nearly a fifth (19%) were victims; the comparable figure for men was tiny, just 2%; whereas 61% of women were mentioned of quoted in an expert or professional capacity, the figure for men was 82%. The research also looked at the way photos are used. It found that men account for the majority of front page photographs (64%), and that no female politicians featured in the top-ten images used on front pages during the period of the research. Where photos of senior women were used, the images were often unflattering or apparently intended to make them look ridiculous. For instance, home secretary Theresa May, appeared on a front page as the main picture four times during the month, but three of those were of the same image, with her pulling her mouth down in a grimace. The German chancellor, Angela Merkel, was pictured three times during the research period, but twice the shot was of her with her hands up in the air, puffing her cheeks out. There were few pictures in which women looked sensible and serious. It remains to be seen which version of Julia Gillard has the strongest hold on the media imagination in the longer term: the formidable politician, in command of herself and her argument; or the woman who can’t even walk on wet grass in her heels without falling on her face. * ‘Seen but not heard: how women make front page news,’ Women in Journalism, October 2012.